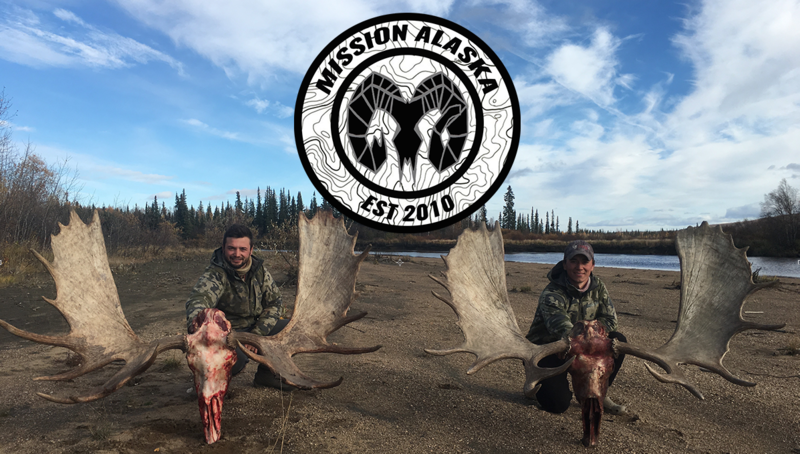 Many hunters I have talked to claim it to be the hardest animal to harvest, not only because of its remarkable elusiveness, but mainly because of the landscape that they call home. Sheer rock cliffs that will send you plummeting to your death with one false step. Winds that literally rip your tent off the ground if one stake is not set correctly. Unexpected rock slides that start off innocent and harmless, but soon turn into bundles of rocks from hell. And now, I can finally claim that I have hunted the mystic animal. I started out on my adventure hoping to find a legal ram on the cliff side, and in that respect I was unsuccessful. But what I did come back with was an experience of a lifetime and a new profound outlook on Sheep that I was oblivious to for the first 21 years of my life. This was the longest planned hunt or camping trip that I have ever carried out from traversing Crow’s Pass or hiking parts of the Appalachian Trail in Vermont and Massachusetts. It all started with my neighbor, Loren Rupe’s, telling me a good spot that his father, Galen Rupe, had hunted 30 years ago. After this insider information, Loren was kind enough to fly me over the spot with his father showing me the hot spots from the air. 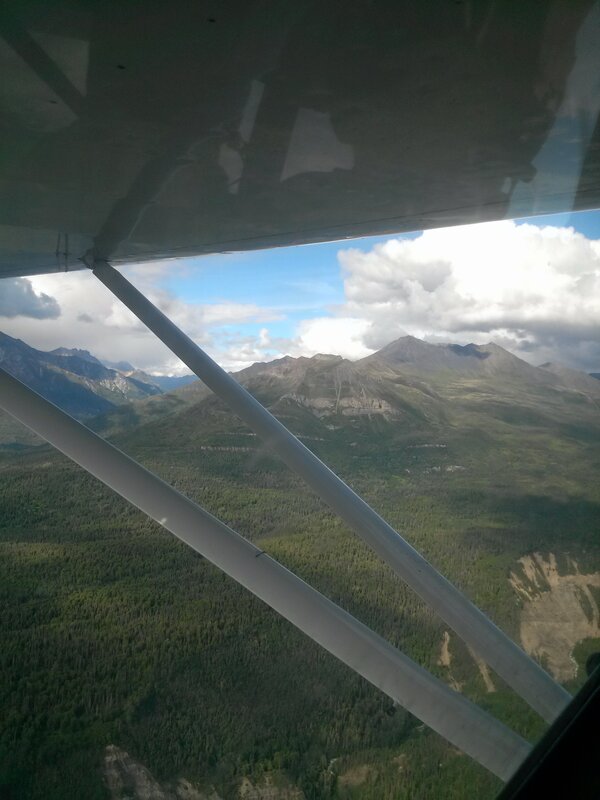 After Loren was kind enough to take me on an aerial view of the mountain two times, the rest was up to me to plan my route. With topo map in hand and google earth handy, my father and I sat down and found a good route for me to go in and if need be to set up a base camp at a nearby lake. The planning was crucially as I had no idea if the route even made it to the base of the mountain. 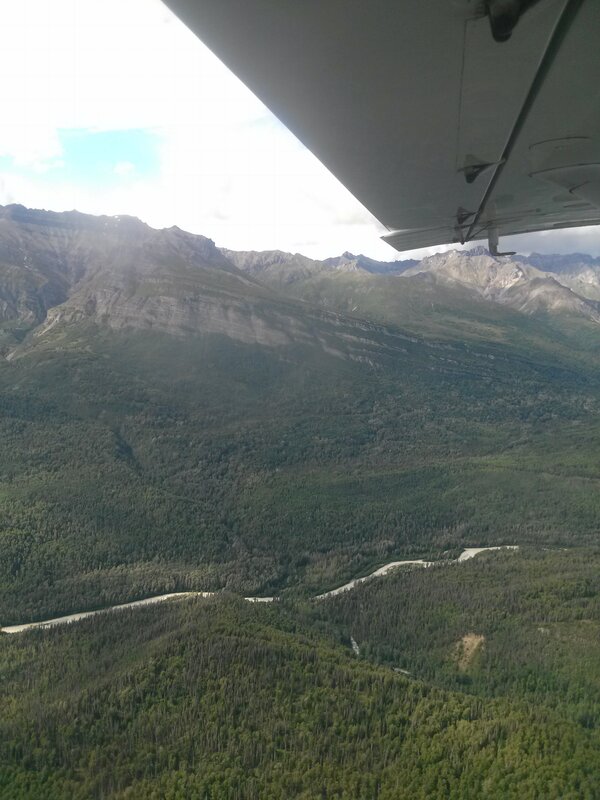 We could tell vaguely from the air that there was a path leading most of the way up, but as any Alaskan will tell you, bush whacking through thick alders in an area that is only inhibited by bears and is home to wolves dens is not the most calming experience. View of my first night’s base camp. The wind in this valley was so strong, I ended up packing up and heading out before night set in. After the long wait I finally started my adventure. 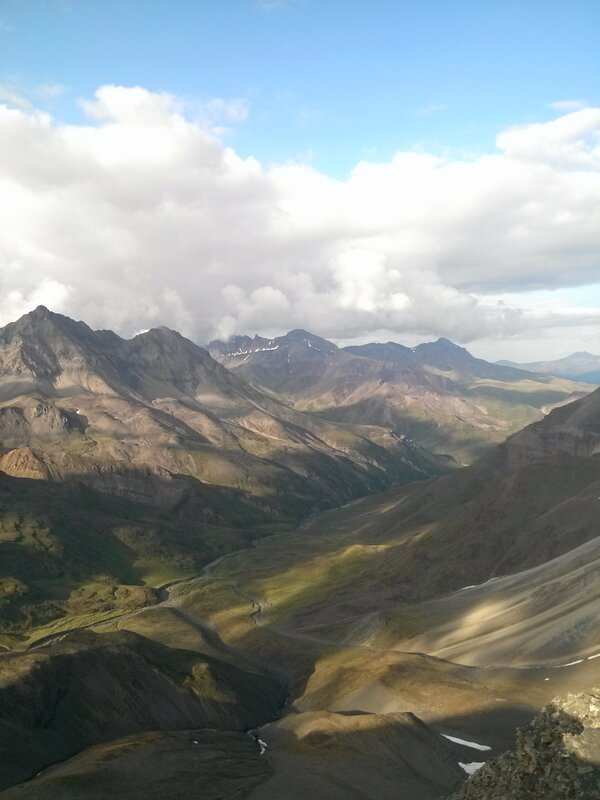 Trekking up this mountain was no easy feat. As the crow fly’s the trip is roughly 4 miles long. 4 miles that took me 6 hours to complete. For every step I took it seemed as if the loose fragile rocks on the mountain pulled me back three steps. Switch-backing the mountain seemed to get me no where so I had to get a tall glass of “man the hell up” and roughed it up the ridge. 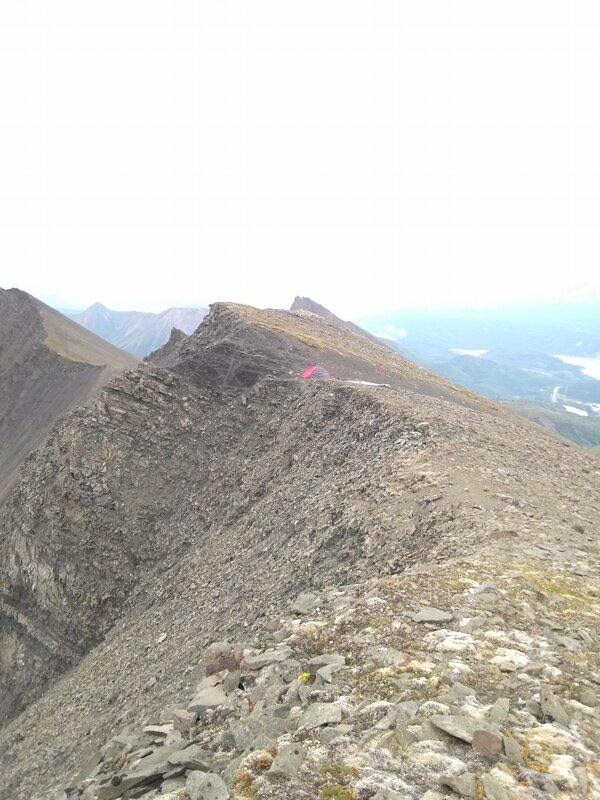 My spirits were low and I was fatigued, but that changed instantly when I hit the ridge line. Literally as soon as I reached the top I heard a loud “BANG” followed by several other rocks following the first cluster down the mountain. It was unmistakably a sheep walking below me. I dropped my pack, loaded my rifle and took aim. The majestic creature was standing there without a care in the world as I prayed to the hunting gods that it was legal. Further review of the animal showed that it was not legal, but it instantly raised my spirits. 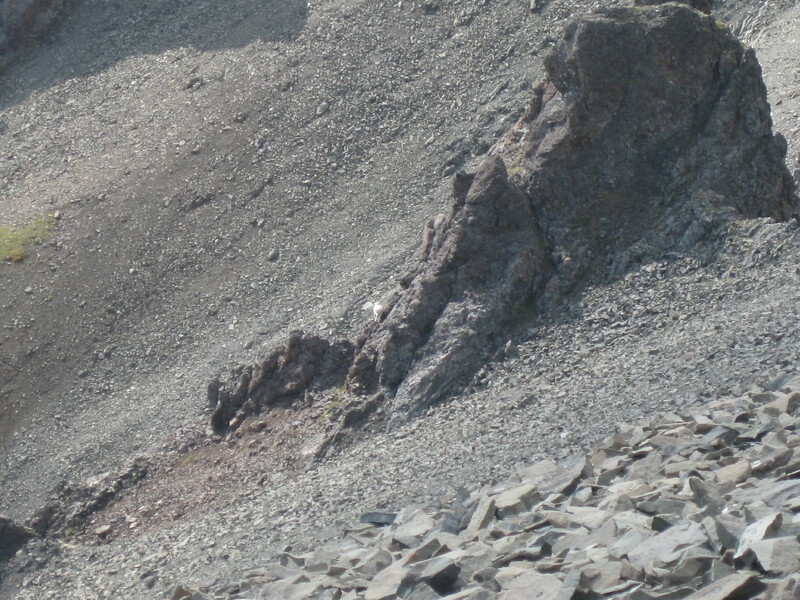 First Sheep I saw standing at the lower part of the rock face. 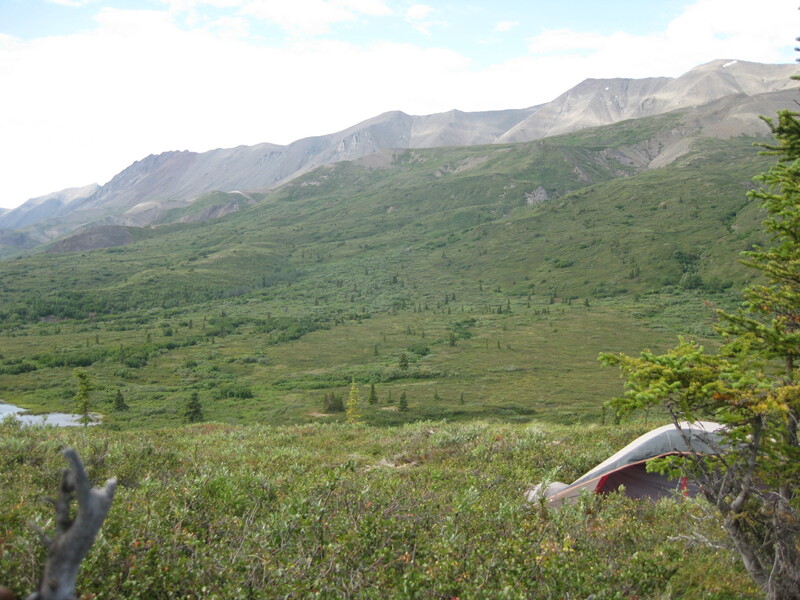 After this encounter I set up camp and from my vantage point I could see several caribou and other non-legal sheep feeding in the valley below me. The valley was so serene and beautiful it was like a whole new world. Sheep and Caribou were living in harmony and the Sheep came down all the way to the creek, something that I was unaware they would do. Another view from my camp. The days went by fast as the sheep were in abundance and the nights were rough with strong winds and rains, but the hope of finding the trophy sheep was worth the hike and the nights. As the days went by I followed at least 20 sheep through their daily adventures without seeing one legal ram. Finally on the night prior to my departure while I was about to crack open my expired MRE, I noticed two white specks on a ridge to my left. 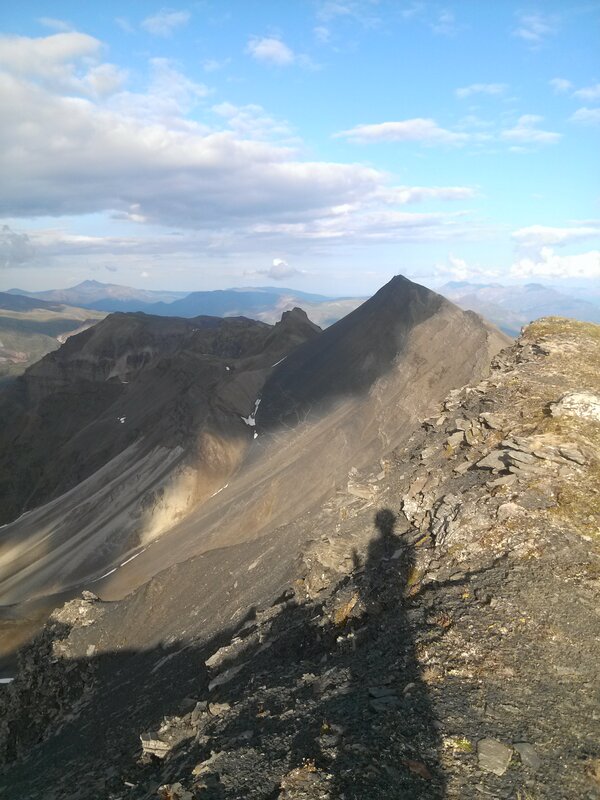 I had been to this ridge earlier and it was an hour hike from my camp. These sheep intrigued me because there was a large speck following a smaller one. Bingo I thought. A full curl following an Ewe. The sun was still out so I ran the ridge line with MRE in one hand and rifle in the other wearing my day clothes. 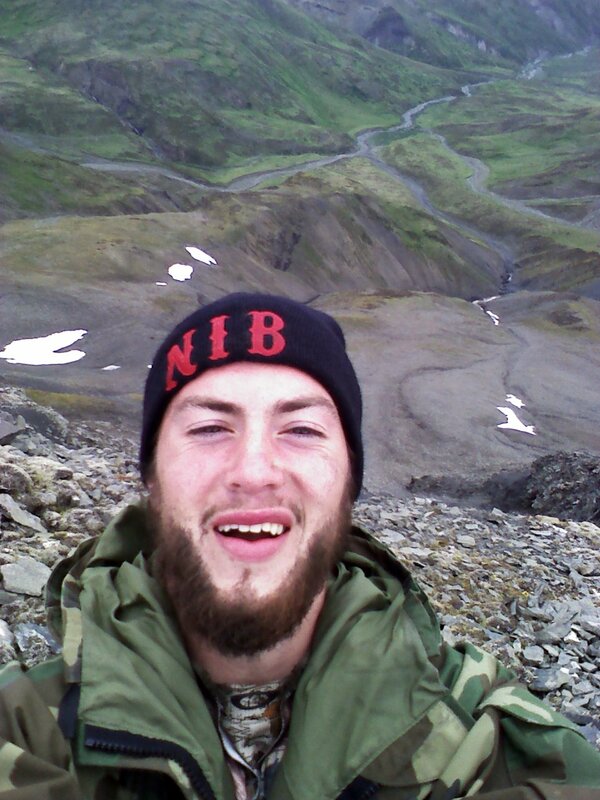 When I finally arrived at the ridge, my hopes were sky rocketing because I could see horns on one sheep, something I hadn’t been able to see with the naked eye on any other sheep all hunt. They were still a good distance away so I opened up dinner and ate the 1994 MRE (courtesy of my dad from his hunts) and waited for them to feed my way. Well as Alaska weather would have it, strong winds came without warning and the temperature started to stop drastically. So here I am in August with the potential of hypothermia if I don’t return to my camp or a chance to harvest a fine creature. I roughed it out for another 30 minutes of shivering waiting and waiting for my chance. The Ewe fed write down a saddle directly below me and the ram soon followed. My nerves were out the roof and I was so sure that this was my chance. As luck would have it, the ram was a three quarter curl and was not legal. I sat there using all my will to make that curl become a full curl so hard, but it never happened. So my hunt was over and I left the mountain empty handed, but a great experience none the less.I had such a great time that I plan on heading back out monday to undertake the gruelly trip to the peak of the mountain for one more chance this year. I leave you with this picture of all the tracks of the game on the cliff side which still gives me hope! Special thanks to Loren Rupe for flying me over this spot, Galen Rupe for telling me about it, my Father, Mark Van Ness for all the help, Herb Mansavage for his help and of course Austin Manelick for letting me share my experience with the world!